The start of autumn is always tinged with a bit of sadness for me, as it co-incides with the start of the horrible duck shooting season. Beautiful, gentle creatures are shot in the name of ‘sport’ or ‘recreation’ or ‘fun’ and I just can’t understand how it is allowed to happen. Lake Murdeduke was not closed to duck hunting, despite the presence of the buff-breasted sandpiper and ruff and hundreds of other migratory shorebirds that had made the lake their home over the summer. What a crazy world we live in that guns win over the peaceful love of nature. I forget sometimes that I have to avoid wetlands and stumble across people shooting and it really is dreadful. So when I see a duck in the next few months I will talk to it and tell it how fortunate it is that it has not been blown to smithereens. I had a lovely weekend a few weeks ago at the Birdlife Photography Conference that was held at the Deakin Waterfront Campus. I learned that there is an awful lot that I don’t know about cameras. A young man from Canon Collective named Jay, who is a wildlife photographer and guide, talked for a few sessions about taking wildlife photos with a Canon camera, and he was just incredible with his knowledge and skill. He tried to sell me a Canon 500mm lens that was on special for over $11,000. Three months wages on a lens was a bit beyond my budget, but I certainly had lens envy when he displayed his lens kit. Maybe in my next life I might be able to afford it. 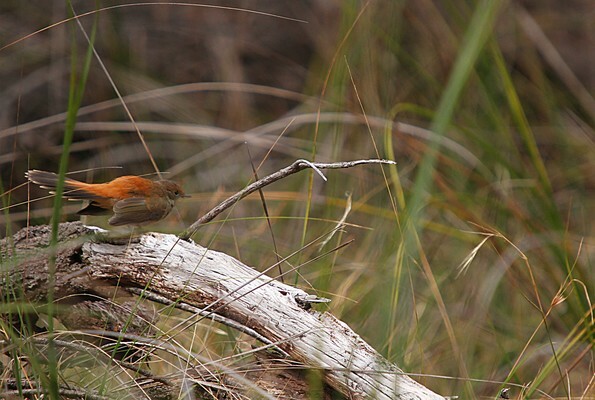 I took a few of the photographers to the Ocean Grove Nature Reserve, and we saw a rufous fantail on the Banksia Track, which certainly was a highlight. Rufous fantails are incredibly hard to photograph, and this one proved no exception, but we all got a good look at the bird before it disappeared into the bushes. I also took a group to Anakie Gorge (or should I say I was meant to but nobody showed up). 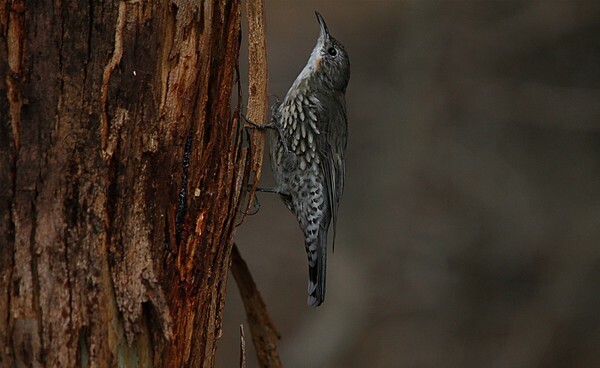 I had a lovely time out there trying out my newly learned camera skills on the white-throated treecreepers. I had a wonderful day at Western Treatment Plant with Tom. The weather was glorious and the birds were out in force. The highlights were seeing a young spotted harrier (magnificent bird) and around 80 other species. Many migratory waders were in breeding plumage, and preparing to fly to the Northern Hemisphere, and I expect that there will be a lot less birds at WTP when I next go there. I thought I’d take a detour to Point Henry on my way to work one day, as there are usually some raptors there, and we all know that a raptor a day keeps the doctor away. Anyway as I was driving towards the now defunct Alcoa Plant I looked at one of the large power poles and thought that there was a person climbing on one, such was the size of a creature that was on it. As I approached I realised that the animal on the pole was in fact the biggest raptor of them all, a wedge-tailed eagle, and it was a young fledgling going by the white feathers on the underside. It cheered me up no end to see such a impressive bird on such a beautiful day when I was on my way to work. I also saw a raptor when I went to Day on the Green in Geelong, and I hope that the black-shouldered kite was enjoying Don Henley as much as I was. 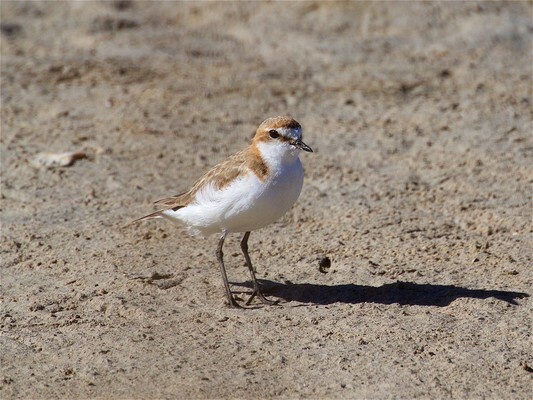 I received a lovely email from Kevin, who had a closer encounter with a red-capped plover at Point Lonsdale. Thanks so much for sending in your beautiful photos Kevin. 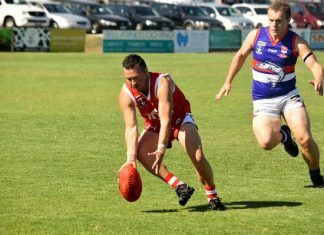 If you are interested in any organised bird watching activities, you can access the calendar of events organised by Bellarine Birdlife at http://birdlife.org.au/locations/birdlife-bellarine-peninsula.